The CBU Secretariat extends its thanks to delegates, exhibitors and presenters who have already submitted their registration forms for the CBU’s 47th Annual General Assembly, ahead of the original registration closing date of June 24, 2016. In collaboration with the main conference hotels, the Secretariat is pleased to advise, the registration period has been extended to Wednesday, July 13, 2016. However, please note there is a limited number of rooms blocked for Assembly delegates. After the booking deadline, rooms will be subject to availability, and only at regular rates. Highlights of this year’s Assembly include a forum on “Media Innovation and Transformation” from the CEO of the South African Broadcasting Corporation, Mr Jimi Matthews; a seminar on Disaster Risk and the Media, to be addressed by Mr Ronald Jackson, Executive Director of the Caribbean Disaster and Emergency Management Agency (CDEMA); a spotlight on Digital Radio standards featuring Ms. Ruxandra Obreja, Chairman of Digital Radio Mondiale, as well as a half-day seminar on “Doing Business in Cuba”, hosted by the national Chamber of Commerce. As always, the best of the media offerings from the region will be celebrated at the Caribbean Broadcasting Awards gala, on the evening of Tuesday, October 25. The CBU has negotiated a special rate for participants to experience La Parisien at Hotel Nacional, hailed as the best cabaret in Havana. In addition, all participants are invited to stay after the Members’ session on Thursday October 27, for an afternoon trip to enjoy the art and handicraft at La Feria in Old Havana, as well as a day tour of Pinar del Rio on Friday October 28. 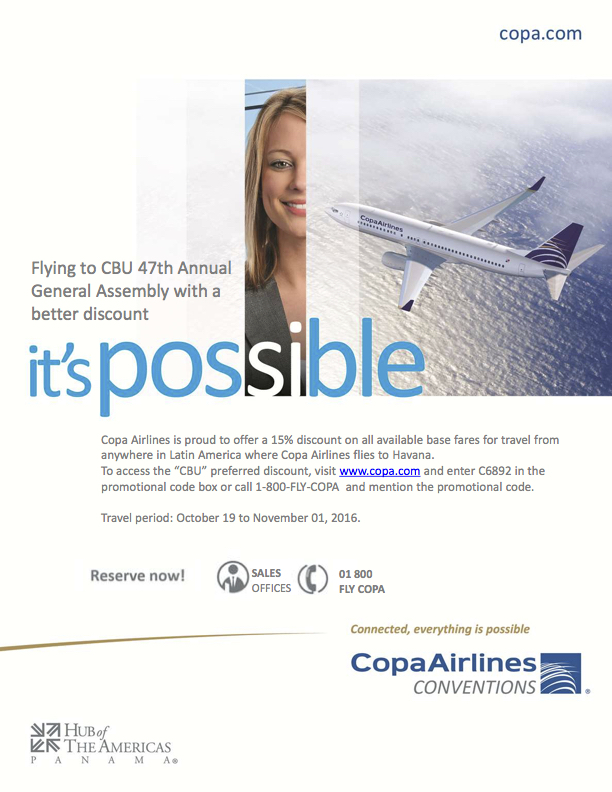 CBU has negotiated discounted airfare for delegates travelling to Havana on the official airline of the event, Copa Airlines. The discounts are valid for the event attendee and one (1) travel companion, for travel up to 5 days before and after the AGA. 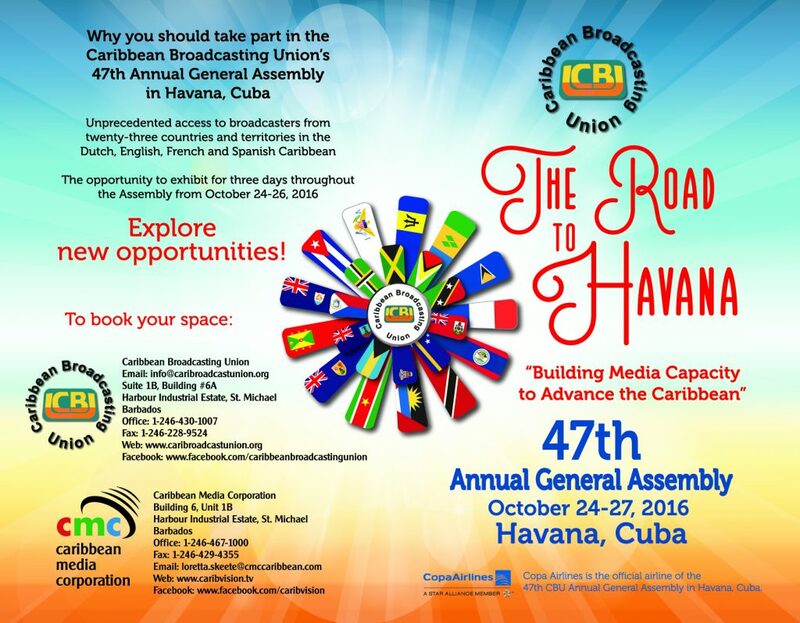 For registration details, including updated information for payment by wire transfer contact info@caribroadcastunion.org or +1(246)430-1007 or check the CBU website at http://caribroadcastunion.org/annual-general-assembly/annual-general-assembly-2016/. For more information about the customized packages for sponsors and exhibitors, contact Mrs. Loretta Skeete at loretta.skeete@cmccaribbean.com or the CBU Secretariat at admin@caribroadcastunion.org. Looking forward to welcoming you to Havana, Cuba in October! 6.30 PM – 8.00 PM Forum 5: ADVANCING MEDIA SECTOR CAPACITY ENVIRONMENTALLY – DISASTER RISK REDUCTION AND THE MEDIA – Mr. Alexander Zink, Vice-Chair DRM “Digital Radio for All”. 3.15 P.M. – 3.30 P.M. 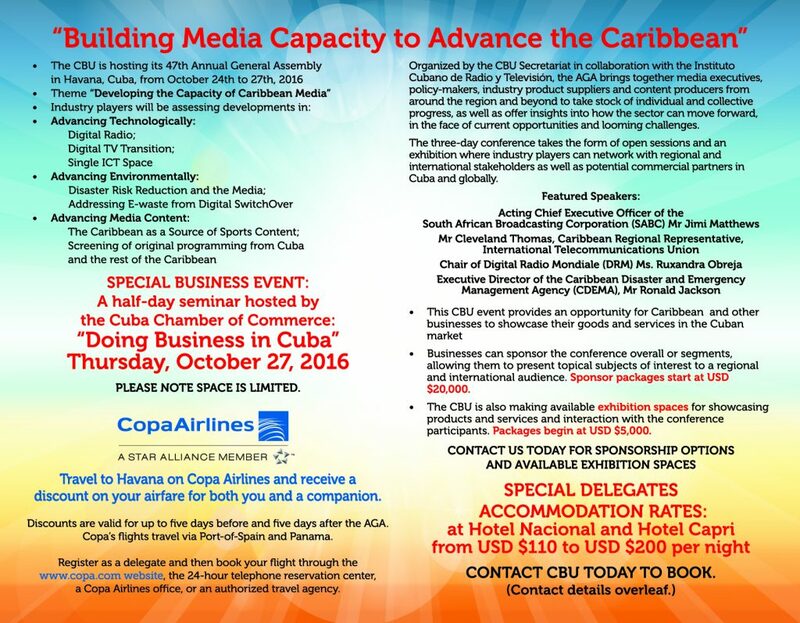 The next CBU Annual General Assembly (AGA) will be held in Cuba from October 24 to 27, 2016 under the theme, “Developing the Capacity of Caribbean Media”. Organized by the CBU Secretariat in collaboration with the main host broadcaster, the AGA brings together media executives, policy-makers, industry product suppliers and content producers from around the region and beyond, to take stock of individual and collective progress, as well as offer insights into how the sector can move forward, in the face of current opportunities and looming challenges. During the three-day conference to be followed by a general meeting of the Union’s members, media executives, broadcast manufacturers, development professionals and other sector players will examine the sub-themes: Advancing Technologically; Advancing Environmentally and Advancing Media Content. The AGA will also feature a half-day workshop, hosted by the Cuban Chamber of Commerce, at which partners will be able to explore opportunities for business in the Cuban market.